This post contains affiliate links. If you make a purchase after clicking a link, I may earn a commission with NO extra cost to you. Thank you for supporting my writing. My senior year in high school, we were assigned to read The Canterbury Tales in English class. Mrs. Hendrix, our teacher, handed out our copies and a list of Tales we could choose to read from. Among these were The Knight’s Tale, The Wife of Bath’s Tale, and The Monk’s Tale; in other words, the tales that were more virtuous, the tales that would teach us values. Then she told us we were absolutely, positively NOT to read those that were not on the list. You know, the vulgar ones like The Miller’s Tale. It was a brilliant move. Being typical teenagers, we immediately began reading those that were “banned”. We may have thought we were getting away with something; who would know if we read the ones we were not supposed to? As a result, we read at least twice as much as we were assigned. And of course, that was why she so vocally told us not to. Eighteen years later I am living in England. Salman Rushdie’s The Satanic Verses is published, followed by the Muslim outrage over its content. It was when the Ayatollah issued a fatwa ordering Muslims to kill Rushdie that I really took notice. There were protests outside British bookstores, book burnings were held, and even bombings of bookstores. I wanted to read the book, to see what all the fuss was about for myself. And to be a bit rebellious. The act of challenging or banning books removes them from access, often before many people become aware of them. This is why shining a light on titles that have been banned or challenged is so important. Get the word out so people are aware of books that are published, but which they don’t have easy access to. Let them know that someone, somewhere thought the books were inappropriate and therefore made sure that NO ONE would be able to read them. We need to make some noise about the books that are challenged and banned, and not just during one week in September. We need to be more vocal all the time. Remind people that there is still a danger that they cannot read what they want because books continue to be challenged and banned. 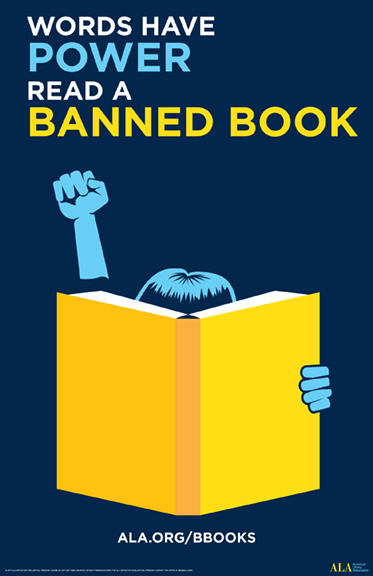 Remind them of all the books that are on the list of banned books, maybe even ones they thought they’d like to read. Remind them to get a copy and read and decide for themselves what they think of it. Remind them to act like rebellious teenagers. In that spirit, I am going to do what I did not do in 1988. I am going to finally read The Satanic Verses. I hope you will join me. 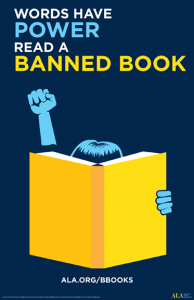 What banned book have you been meaning to read, but not gotten around to? Why not read it now?